Have the following code. Content Type should be image/gif but is returning application/octet-stream. 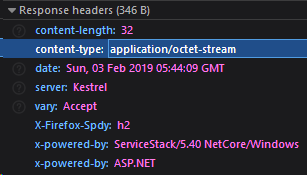 Is there a way to override the application/octet-stream? If I'm reading Service Return Types correctly, byte are not converted to a different content type? It wont override custom content-types from this commit, available from latest v5.4.1 on MyGet. Sweet! Thanks! And thanks for the quick response & commit!